WHEN GATHERING THE RESISTORS FOR PROJECT MAKE SURE TO NOT MAKE THE MISTAKE AND GRAB 100K RESISTORS! THE CODE RECCOMENDS 100 ohms. WHEN LOOK FOR 100 ohms, SELECT THE RESISTORS WITH JUST THE NUMBER "100" WRITTEN ON THEM. THE CODE WAS FIRST TESTED WITH BUZZERS TO MAKE SURE THE CODE WAS WORKING. FOR FINAL CONSTRUCTION THE SPEAKERS WILL BE ADDED. The sound box will test different building materials for sound absorbency. 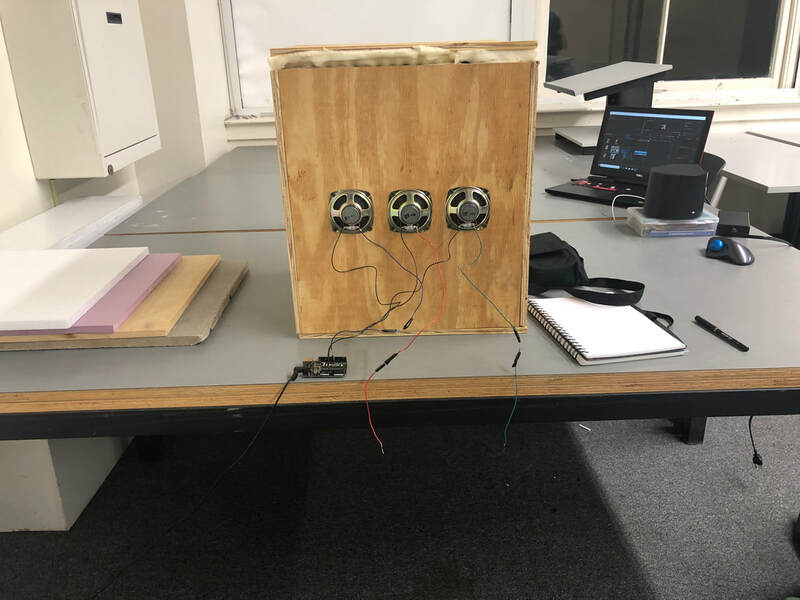 Without building a sound proofing wall, this experiment will be able to test what material on its own will be able to absorb noise at different decibels. The results will be measured by using a 5-N-1 reader to be able to record the changes in air pressure caused by sound waves which will then be converted into an electrical signal, and displaying the resulting sound pressures read in decibels. The different frequencies that will be tested through the speakers are 20 Hz to 16kHz over a three minute period. By using the inner testing chamber the 5-N-1 will be able to assess the noise of sound level coming from the tested material. The sound box should be placed in an area that is relatively quiet so the 5-N-1 can accurately test the noise levels moving through the testing material. Sound travels like air and this can cause for some of the test results to read inaccurately. Testing each side of the box to make sure it is sound proof is a pertinent part of the experiment. Step 1 : Figure out what material you want to test and cut it down to fit inside the book. Make sure your material fits inside tightly. Step 5: RECORD FOR THREE MINUTES OR WHEN 5-N-1 IS CONSTANT. Use excel graphs to record data and compare test results from one material to another.